Today I’ll give you a glimpse of my morning shower routine so you can see how I have simplified my toiletries and eliminated chemicals altogether. It may be too simple for some and extraneous for others, but I’m confident everyone will be able to glean something helpful. Let me start by sharing the humorous history of my love for long, hot showers. Growing up in Michigan, my bedroom and shower room were on one end of a long ranch style home heated by a wood burner clear on the other side. That means both rooms were very cold during long Michigan winters. Did I mention the water pressure was horrible? Put the two together and it scarred me for life. 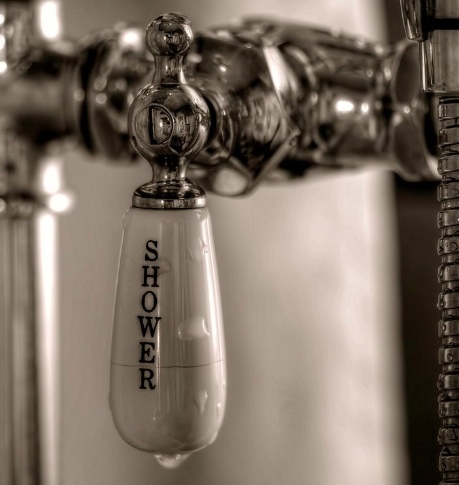 Now that I’m in control of the plumbing, my showers are a long dance with hot water – and I love it! I don’t use shampoo and haven’t for several years. I have short hair, and if yours is long you’ll probably need shampoo. Don’t buy it from the store, make it yourself. Need conditioner? Don’t worry, you can make that too. I scrub and massage my hair and scalp under the water for several minutes. This stimulates the scalp and keeps natural oils in place, which also helps eliminate dandruff and renders hair spray (gel, mousse, etc.) unnecessary. I lather up my body, but not my face. (On a daily basis, I soap only my arm pits and unmentionables, unless I’m dirty or sweaty elsewhere.) I only use soap on my face when I shave, which I do about once per week. While the suds do their work I gently wash my face with a wet washcloth. The water and exfoliating action of the washcloth provide all the cleaning I need without stripping away the healthy, natural oils; this also allows me to eliminate the need for face lotion, except after shaving. If I do shave, I skip the shaving cream (gel, etc.) using the soap instead. Real soap is much better for your skin than commercial shaving lubricants, it usually costs less, and is another way to simplify your routine. I close by rinsing off any remaining soap and toweling off. 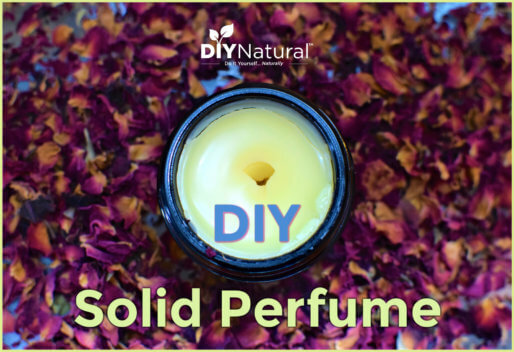 There are so many reasons to make your own deodorant, but we’ll keep it as simple as saying it’s much less expensive and is free from toxins common to commercial products. After a few sprays I rub it around with a chicken dance and call it good. Once all of the above are done it’s time to get dressed. Yep, it’s as simple as that folks. All of what you need, and none of what you don’t. I challenge you to choose one thing in your bathroom routine this week to simplify and make natural. If you’re already employing other simple, natural solutions, leave a comment to share your experience with the community. God bless and happy grooming! I’m wondering if some are having trouble with natural products not working, might be due to very hard water? We have extremely hard water here in s. central TX so I’ve had to tweak a lot of the make yer own cleaners and personal care things so they will work. Also, the pH balance would likely be a factor; I figure our water here is very alkaline, due to the lime. I have been making my own soap now for about 6 months. I am still experimenting, but I now have a specific recipe for body and face and a stronger recipe for use in cleaning products. I have even started using clippings from my garden to add fragrance such as lemon verbena. I grate my soap and add distilled water to form a body wash that is out of this world. I have adult acne, and my homemade soap has cleared it up! Thank you Matt and Betsy for inspiring me to start making my own natural products! Have you had anyone with an issue with using the alcohol spray for deodorant? Because it’s not working for me AT ALL. Am I super stinky, I wonder? I’m using the high percentage Everclear. Wasn’t working for more than half an hour on it’s own so I added a few drops of tea tree oil. Still doesn’t work, even if I reapply. Am I doing something wrong? Using vinegar as conditioner doesn’t give any conditioning to my hair either, although I love the baking soda shampoo. Suggestions? Or am I just screwed as far as natural care goes? The most important part of trying to make more natural products yourself, is to keep trying till you get it right. Many times the final working product varies from person to person, so keep trying. Sounds like you need more tea tree oil (between 5-10 per ounce should do it). For the conditioner, keep using it and give your hair time to adjust. Virgin Coconut Oil helped me a lot. Rub a tiny bit between your palms and smooth over your hair, or even onto a natural bristle brush and then brush through. Smooths out frizzies, adds shine and you also get a really nice, light coconut fragrance to your hair. If you want a serious deep treatment, rub a generous amount through your hair and let sit for as long as you like, then wash your hair. Plus, coconut oil has SO many other uses, it’s not an expensive addition to your pantry. Marie- i had the same problem! My hair dried out using the baking soda and the vinegar didn’t help at all! I refilled my bottle ( I use a cheap Dollar General spray bottle) with half vinegar and half water. I also added eucalyptus essential oil (10 drops) I think. I’m sure you could use whatever essential oil you wanted, it’s just the one I happened to have at the time. I plan on buying lavendar for the next time. Works a lot better (at least so far). I tried coconut oil and it was disastrous! So oily for days! After multiple washes per day!!! With a little essential oil, I think it helps moisturize a bit better. It also leaves a very faint smell rather than none at with just the vinegar! Hope it helps! If the coconut oil didn’t work, I have had really good luck with olive oil. I start with a very small amount and run it through my hair like I would an elixir. Use with caution, but a small amount can be left on all day instead of styling products. Works great against frizz and leaves my hair shiny. I LOVE how simple life really can be. Since eliminating shampoos/conditioners, deoderants, etc a few years back, I’ve enjoyed more space in the shower/bath/drawers, and knowing we aren’t adding garbage to the environment. Simplifying life always seems to be a positive. Unfortunately the store doesn’t have any soap that is labeled REAL SOAP! Can you give me some brands, kinds or ingredients to look for? I am currently using Dr. Bronner’s castile soap but it gets a little pricey! I do love it though!!! By real soap I mean a soap with no toxic ingredients, Dr. Bronner’s is great stuff. Not specifically no. The best thing to do is to teach yourself how to research product ingredients. Start by Googling the ingredient your unfamiliar with, being sure to read several different sources and several different opinions before forming your own. Hello! I LOVE your posts on Facebook and emails! Especially yesterday’s post about simplifying personal products. I learned so much from it. For the first time, I washed my hair with baking soda, and I am very pleased with the results! Yay! I have recently purchased castile soap and have mixed it for various purposes and have been making homemade laundry soap for the past month. The information you provide dovetails wonderfully with the changes that are being made in my family. Thank you so much! Thanks Shelley, we’re so glad to help. You made me smile. God bless. I just recently found your site and have been trying to replace my toiletries one by one. So far I have been using the baking soda for 12 days for washing my hair. I was always one to have to wash my hair daily, I can now go 3 days before needing to wash my hair. It’s wonderful cause my hair was also breaking now it’s gotten stronger. I am also using the vinegar rinse instead of conditioner. I tried to use the vinegar as a spray and leave it in but couldn’t so I spray my hair in the shower ( I also spray down the walls of the shower for cutting down on cleaning) leave it on while I finish up then last thing I rinse my hair and spray down the walls 🙂 I have been using vinegar for cleaning for years so everytime I shower the toilet gets some vinegar in the bowl, the mirror gets a wipe down of vinegar soaked wachcloth after my shower using the steam from the shower. I may only take a 5 mins shower but it takes me 10-15 mins to get out of the bathroom because of my wipedown of the whole bath during and after. My next replacement will be my toothpaste. I use a deoderant from the healthfood store that is aloe, vitamin e and tea tree oil. It may cost $8 but it lasts me almost a year for the roll-on. Great stuff Laila. Thanks for sharing your tips and for sharing the info with your community. God bless. Thanks for the info and link Doris. • 3% Pharmaceutical Grade: This is the grade sold at your local drugstore or supermarket. This product is not recommended for internal use. It contains an assortment of stabilizers which shouldn’t be ingested. Various stabilizers include: acetanilide, phenol, sodium stanate and tertrasodium phosphate. Here’s one I just tried last night and it worked great: For eye makeup remover, mix 2 ounces of water, 2 tablespoons of extra virgin olive oil and a squirt of gel from an aloe plant (or aloe vera gel). Put in a lidded jar and shake. To remove makeup, put some on a cotton ball and wipe your eye gently. Works as great as any commercial product, but its all natural, good for you and way cheap! Thanks for sharing Jolynn, and nice work. I tried an experiment. I have always had acne here and there but after a severe allergic reaction to sunscreen, my face exploded. I was using acne treatment for years to help control it but my regular routine was not working one bit. I decided to go natural. I have eliminated all chemicals from touching my face. I now use only water to wash my face and sugar to exfoliate (every other day or so). I use witch hazel as a cleanser. It feels awesome! Then I put full strength 100% Pure Tea Tree oil all over my face. My acne has completely turned around and I no longer even put makeup on. This has cut my morning routine in half and I’ll never go back. I’m still in the experimental phase but so far, my skin is better then it has been in a long time. Thanks! I may do that. I’ve recently discovered Tea Tree Oil and use it place of Neosporin, on wounds and pimples.I’m 54 but still have ‘teenage’ oily skin. Every once in a while I’ll get a large, painful pimple try to surface and found TTO will not only ‘keep it under wraps’ but makes it go away (not even Colloidal Silver did that). I’m using TTO now on a the beginnings of a cold sore and it seems to be working pretty well. I plan to try the deodorant recipe and use it in there too. Thank you for all of your work on your site! I wanted to mention that there are cautions against using isopropyl alcohol, as it can cause a number of malidies from liver damage to depression even through skin absorption. As for homemade soap, it is quite easy and rewarding. I just made a 3 pound batch using only bacon grease and peppermint oil. After curing, there is no bacon smell! Mmmm, bacon soap, I would love to try that! You’re right about the isopropyl alcohol Gregg. Thanks for the reminder, I updated the deodorant article to reflect the change. God bless. Can you give me your recipe for your soap? I have been wanting to try making it myself. 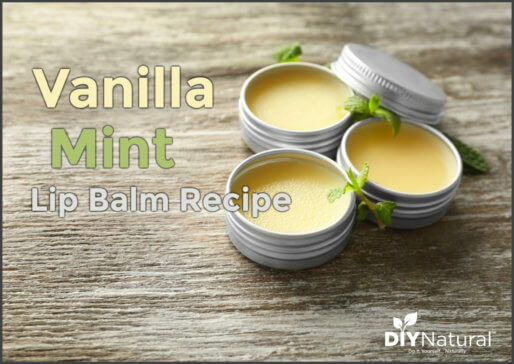 I have switched so many of our products over to homemade and am loving the results! I make laundry soap, dish soap, toothpaste, baby wipes, and I make a salt scrub. I would love to make bar soap too! Guess your sister had more trouble in that area! Great article! Yeah, I remember that Mom. You’re right, Christina’s long hair held that color in SO bad! Good post and most, I don’t think, know they really don’t need all the junk. I use a shampoo with blueing because it makes my naturally colored hair shine. I’ve never colored my hair but it’s now blonde, gray, white and, every now and again, a touch of strawberry blonde still. Handmade soap works for everything and, when traveling, I’ll use it as shampoo as well. I’m still trying to decide about toothpaste…usually use baking soda but need something less abrasive to use with Sonic toothbrush. I shower at night, after a day of farm work showering at night simply makes more sense. I hate going to bed dirty! I never towel dry but wear a 100 percent cotton terry cloth bath robe for 30 minutes or so and let the moisture absorb into the skin. No need for lotions. Great stuff Sandra, love the drying system. 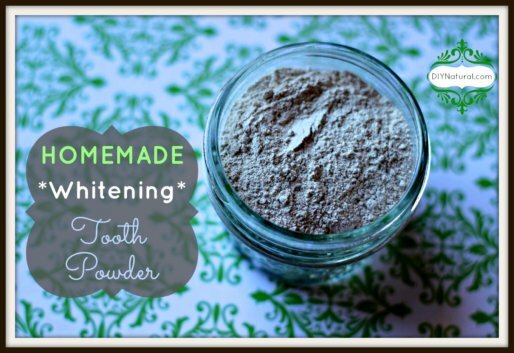 For toothpaste try a bit of EV coconut oil mixed with peppermint, spearmint, or cinnamon EO. It works great. Great info Caeryl, thanks for sharing and congrats on your journey and inspiration to the world. do, it’s coconut oil with a bit of rosemary EO. There is more we can switch out, but it’s a start. That’s a GREAT start Christine. I think your husband will come on board eventually, especially if your kids stay on him like that. LOL. Nice work. You don’t even need to soap up the whole body unless you’re actually dirty. I used to use body wash everyday, but now that I use the washcloth method you use on your face, I only have to use soap when I’m actually dirty or sweaty (which, with this weather, has been almost everyday). Using soap strips your natural oils, and leaves skin dry. I used to spend so much money on body lotion, and now I only use it once or twice a week for my dry skin. Also, because the natural oils are still there, I don’t need shaving cream when I shave my legs or armpits. I haven’t bought shaving cream in years. If you do want extra glide, you can use a little hair conditioner instead of having a separate cream. And now that I’ve recently noticed my “natural” body wash contains all the chemicals I’m trying to avoid, anyone have a body wash recipe? I agree Candice. Though I didn’t mention it in the article, the only parts I soap on a daily basis are my arm pits and my unmentionables – unless I’m dirty or sweaty elsewhere. For body wash try using 1 part liquid castile soap to 4 parts water in a foaming pump bottle. Used hair gel everyday after my shower but soon realized all the chemicals used in the product we’re being absorbed in my scap:( So about 6 months ago I told my wife I’m finished using hair gel since its junk! She did a little google search and found a website that had natural remedies for hair gel 🙂 So now I use “Vitamin E” oil for my gel and it works great! And if you want a firmer hold use “Aloe Vera gel”. Way to go Mark, great info, thanks so much for sharing.